In case you missed school that day in fourth grade when the reversal of the Chicago River was explained and, like me, are a little fuzzy on the details, here's a cheat sheet, mostly gleaned from The Lost Panoramas: When Chicago Changed Its River and the Land Beyond, the big, historical photo book by Richard Cahan and Michael Williams, published in 2011 by CityFiles Press and the Peggy Notebaert Nature Museum. • There used to be a "continental divide" ridge near the southwest suburb of Summit. Water on one side flowed toward the Gulf, and water on the other side ran toward the Atlantic. • If you wanted to go from the Des Plaines to the Chicago river (or back), you had to carry or slide your canoe across this bump. • When Native Americans showed this portage to explorers Jolliet and Marquette, Jolliet observed that someone ought to dig a canal there. • Nearly 200 years later, the state of Illinois did: the Illinois and Michigan Canal, opened in 1848, became a major commercial transportation route, though it was only six feet deep. • After that, Chicago grew at a rapid pace, dumping all its manufacturing and domestic waste into the Chicago River, which flowed into Lake Michigan, which happened also to be the source of its drinking water. 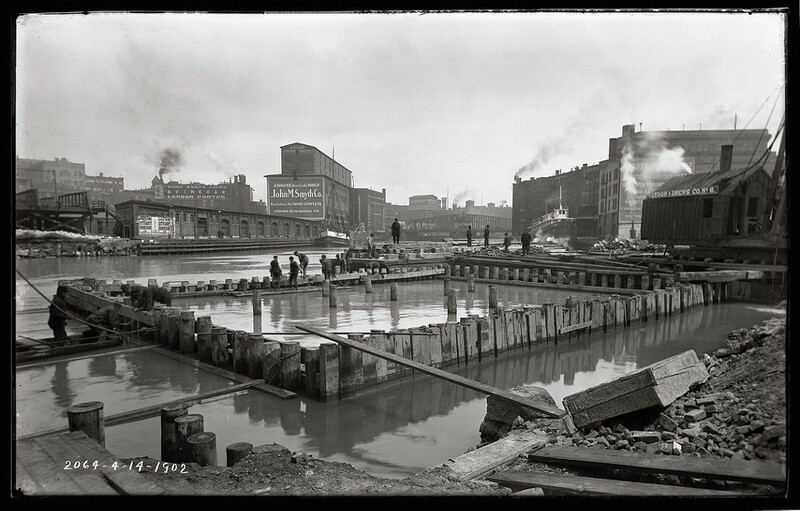 • In the 1860's, thinking it would be good thing to separate drinking water from waste disposal, the city started pumping polluted Chicago River water backward through the I&M, sending its sewage merrily off toward a horrified Saint Louis. That, and deepening part of the I&M, proved to be a temporary fix. • Between 1892 and 1899, a whole new deeper, wider toilet system—er, canal—was built. Initially called the "Big Ditch" or the Chicago Drainage Canal, it sluiced water from Lake Michigan, fully reversing the flow of the Chicago River, swelling the Illinois and loading it with sewage supposedly rendered harmless by dilution. Named one of the "seven wonders of American engineering," it's what we now know as the Sanitary and Ship Canal. •The Cahan and Williams book grew out of the discovery of about 22,000 glass-plate negatives that had been in storage for nearly a century. The work of Sanitary District photographers, the negatives document the building of the canal and its effect on the Des Plaines and Illinois rivers, where it was an "environmental flop." Now The Lost Panoramas, lavishly illustrated with black-and-white photographs made from those negatives, has inspired the composition of a new jazz symphony by Orbert Davis. Commissioned by Symphony Center Presents as part of the CSO's "Rivers" series, The Chicago River will have its premier performance by Davis's Chicago Jazz Philharmonic tonight, May 24, at 8 PM at Symphony Center. It'll include the photographs that were his catalysts. Here's a video preview.